What a crazy time of year this is! Once we get done with birthdays, it's time for Thanksgiving, and before I know it, it's Christmas! 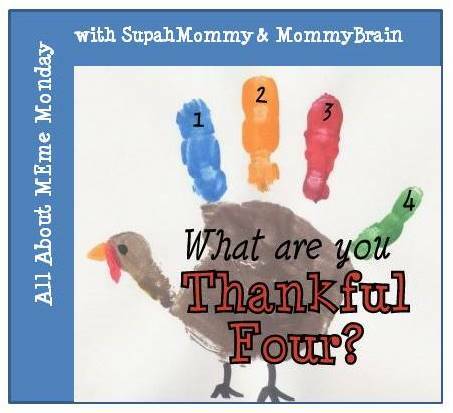 With all the craziness going on right now it's hard to think of 5 things for Meme Monday, so thankfully SupahMommy and MommyBrain agreed on a top 4 this week. Altho, I guess if you want to get all technical on me, thanking them could turn my list of 4 into a list of 5. But who's counting? So anywho, what am I thankful four? Well, sit back, grab your coffee and find out! 3. Happy and healthy children. I see and hear about struggles that some children have to go through. Fights that no one, especially a child, should have to face. I see them fighting a good fight and it makes me realize that children, although small, are often stronger than we realize. But I am so very thankful that my children do not have to fight these fights. 4. Coffee, because you know I can't make it through a whole post without some humor! Without my daily dose of caffeine, I would not be coherent enough to even post this. 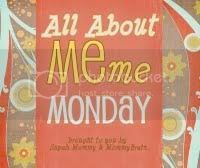 I need that jump start in the morning to be able to accomplish the things I want to get done for the day. Whether it's the house that needs work, or doing something with my kids. Both require heavy doses of caffeine to run smoothly. #3 is a big one for me these days. I can't even read some of the stories about sick children now without getting completely choked up and upset. I don't know how their parents do it, except that you have to be strong for your kids. Whew, I'm going up to hug my healthy son right now! Oh I love the list. Most of all I love the children.. I still try and do that. 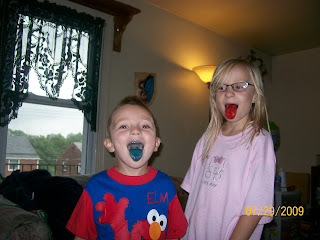 I love finding blue suckers so I can do the same thing..
How cute, I love you post! The leaves, UGH!!! The piles just never go away!! Absolutely love your post! I giggled at the colored tongue. That was just precious. Caffeine is like life support at my house. Gotta get it into the bloodstream before functioning properly. I hear you with the caffeine. Mine comes through diet soda, but I can't not have it. I so agree with the healthy children. I feel so blessed! What a great list! You're funny!! This is a great post and a great list! Have a great Turkey Day!